We hope you don't have to use our warranty or repair service. If you find you have problems you need fixed, we apologise in advance for your troubles. We also hope to learn from each warranty case we handle, and ask that you provide as much feedback as possible so we can improve our products and services in the future. After you have read the following information feel free to contact us for further information. For DIY kits, see the note below on DIY kit repairs. All returns may be opened by the Australian Customs Service on re-entry to Australia. To make our life easier and your return hassle free (and with no added expenses), we ask you treat all returns, (either pre-built units or DIY kits), as warranty REPAIRS. See the note below for more information on addresing goods. Satisfy yourself the unit is in fact faulty and has not just been set up improperly. This is important as we reserve the right to charge a fee for fully working goods returned to us. Obtain an RMA number before sending anything back - This ensures we can track your return, and nothing gets lost. Fully detail in writing what problems you are having - we need a printed copy of any faults you have seen, including how to reproduce these faults. The goods your return must include this printed information. Include a return address - in general, to return your goods, we will use the address you supplied in your original order. If you have moved since you ordered then you should explicitly point this out to us in the prionted information sent inside the packaging WITH the goods. We will probably discard your packaging, so don't rely on a return address on the outside of the box. 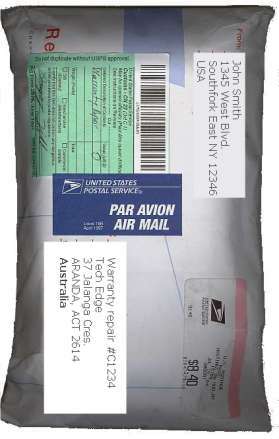 We prefer you send goods back to us via AIR MAIL, or in Australia use Express Post (to our street address). There are two reasons for this, cost and possible problems with our local Australian Customs Service. People are often surprised how expensive it can be to use an international courier such as FedEx. AIR MAIL will take only slightly longer than an international courier, will cost you much less, and will be much easier and cheaper for us to handle any possible customs issues. If you don't so this, many couriers, including UPS & DHL, will automatically charge us a customs clearance fee at this end assuming the goods are new - we will pass this on to you! It is imperative you fill in a customs declaration form indicating the goods you are returning are the subject of a warranty claim - we suggest you say "WARRANTY REPAIR #nnnn" in the first line of the goods description. Failure to do this can result in extended transit and repair times and extra customs clearance costs. If possible, indicate the goods are NOT new, and have NO commercial value. Make sure all correspondence with us includes the #RMA number as the first part of the subject line of any email (Subject : #4432 -- Your Subject). If you ring you should also be able to quote us the RMA number to save us both time. (Note that RMA numbers, in general, will include the order number from your original order). Some of our products are available as DIY kits. DIY kits don't have any kind of warranty on the construction component that you supply yourself. But we do warrant that all the parts are supplied and they all work. We once offered to fix DIY kits that didn't work for their constructor - but we don't guarantee this option (from 2016). So don't rely on us to restore a (possibly badly built) DIY kit to an as-new pristine condition. If it arrives here for us for inspection, and it's in a rough condition, we'll liaise with you to try to fix it and return it in substantially the condition we got it in. The single most common problem with DIY kits is a poorly constructed cable between the WB unit and the sensor. Always take extra care to check and then double check cables. Remember that when testing WB units, they must run at around 12 Volts from a supply capable of up to 3 Amps while still maintaining a 12 Volt terminal voltage - check this if you are having troubles.